Administrative controls (or work practice controls) are changes in work procedures such as written safety policies, rules, supervision, schedules, and training with the goal of reducing the duration, frequency, and severity of exposure to hazardous chemicals or situations. Those who work with hazardous chemicals in the workplace should already be familiar with the administrative controls required under 29 CFR 1910.1200, the OSHA Hazard Communication Standard. The HazCom standard requires that employers provide information and training about chemical hazards in the workplace. Other OSHA standards address environmental and medical surveillance such as work place inspections, equipment preventive maintenance, and exposure monitoring. In addition, laboratory workers have written policies and procedures (a "chemical hygiene plan") that details safe work practices under 29 CFR 1910.1450, the Laboratory Standard. Although administrative controls can (and should) always be used to control employee exposure, they are prone to human error and can not be relied upon to reduce exposure all the time. Additional control mechanisms such as substitution of less hazardous materials/procedures, engineering controls and personal protective equipment (PPE) may be required to address employee exposure to the hazard(s). Anti-skid floor marking signs from Safety Emporium can help enforce your administrative control program. Performing maintenance operations that involve toxic substances at night when the usual production staff is not present. Rotating workers through various job assignments so that they do not develop repetitive motion injuries. Prohibiting workers from working with ionizing radiation once they have reached a predetermined level of exposure. Requiring workers in hot environments to take breaks in cool rest areas and providing fluids for rehydration. 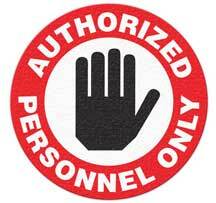 Prohibiting worker access to areas involving hazards such as lasers, energized electrical equipment, or excessive noise. Proper housekeeping. Reducing clutter reduces the chances for an accident and minimizes the effects if an accident does occur. Recognize that administrative, engineering, and other types of controls (including PPE) are not mutually exclusive. Employers may need to use multiple types of controls to prevent employee overexposure. "Occupational Ergonomics: Engineering and Administrative Controls (Principles and Applications in Engineering)", Hardcover, 680 pages, 2003. Estimated price $159.95. Info and/or order. "Safety Made Easy: A Checklist Approach to OSHA Compliance", Paperback, 2007. Estimated price: $91.00. Info and/or order. "Safety Professional's Reference and Study Guide, Second Edition", Hardcover, 2015. Estimated price: $109.16. Info and/or order. "Handbook of Human Factors and Ergonomics", Hardcover, 2012. Estimated price: $270.42. Info and/or order. Safety, Health, and Environmental Concepts for the Process Industry, 2nd Ed", Paperback, 2012. Estimated price: $124.68. Info and/or order. Recognize that an effective risk reduction plan utilizes all all of these steps to reduce the level of risk to as low as reasonably achievable (ALARA). Relying on just one means that a single failure can result in a potentially harmful employee exposure or injury. The exact words "administrative controls" do not appear on many SDS's although some specific work practices may be suggested. Regardless, administrative controls are key to the reduction/elimination of hazards and no worker safety program is complete without these. 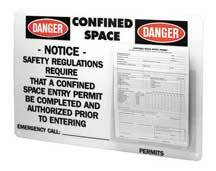 Be compliant with confined space administrative control products from Safety Emporium. Hazard Prevention and Control at OSHA. Part of a very useful Safety & Health Management System eTool. Basics of Informed Substitution & Alternatives Assessment at OSHA. Part of their compilation on Transitioning to Safer Chemicals: A Toolkit for Employers and Workers. 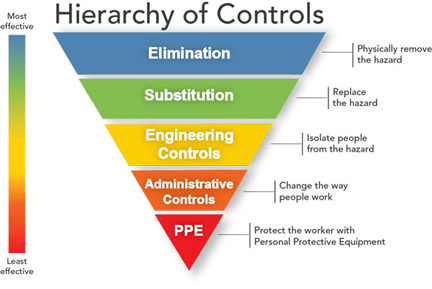 Hierarchy of Controls at NIOSH. Engineering/Administrative Control from Stanford University's Chemical Hygiene Plan. Administrative Controls (PDF, 36Kb) from Indiana University's Lab Safety program. Administrative Controls, a 302 Kb PowerPoint presentation by the MSHA on controlling noise exposure for miners. See also: ALARA, engineering controls, PPE.